Using videos has a higher conversion rate, and we believe that email signature is one of the best places for an effective video distribution strategy. One campaign we did for our client recently showed that, a video in the email signature had 8x more customer engagement rate than a video which is embedded only on the website. We have produced 2 simple videos for our client, actually, it supposed to be a long video as the customer required initially. But we recommended this client to split the long message up into two, so each one will be shorter and more effective in terms of getting the message out. The client is a company provide outsourced HR services. The structure of the two videos are. The first video is a brief intro of the company, explain why and how they can help their clients grow. Our client understand that the building the rapport and trust quickly is the key in acquiring new clients. So logically, the second video was made for the purpose of building trust, telling the customers why they can trust them. This video explained the business owner’s credential and industry record in a detailed level. We thought it can be developed into a very personalised level with a friendly and relaxed tone of voice. We know this would be a very good video for a personalised campaign, we told our client that if he can use this video in the email signature, it should be able to help him to build trust with prospects faster. Because it’s personal and credible and seems to be a right place to fit into as it’s just like a quick self intro video, which supposed to be in his email signature under his name. We then designed the lay out for him, measured the video performance one month after, the result was amazing, it had about 8 times more engagement than the other one which was embedded only on the website and shared on Facebook. Want to learn how to create a professional video embedded email signature? As the result was so good, there was no reason why we don’t migrate this success and create an email signature for another video, and measure the result. But obviously, the other video carries a different content, it’s more like a service promotional type of video, can we use it the same way in an email? Probably not, because each video is designed for a specific audience, we always need to send the right message to the right person. Why Did You Produce The Video? The idea is very simple. Do you still remember the purpose of the company introduction video? It’s about generating awareness, introduce your company to clients and talk about why they exist and how they can solve their customer’s problem. It will work best for the targeted audience who might have the issue but had never heard about you yet. So you can let them know that you and your service exist. We designed another set of signature for our client, tell him that he should use this one to people he needs to contact for the first time. The performance of the company info video raised after this tactic, and within 3 months, the two videos basically goes head to head. The two videos work as a set of marketing asset, and achieved great goal for the client. Producing videos is the first step of implementing video marketing, very much like having a new website is totally the beginning of creating plenty of helpful content. As a video production company, apart from producing great content for clients, we also need to provide the strategy and tactics and help the customers to use the videos to provide value alongside their customer’s buying journey and ensure the videos reach their full potential. 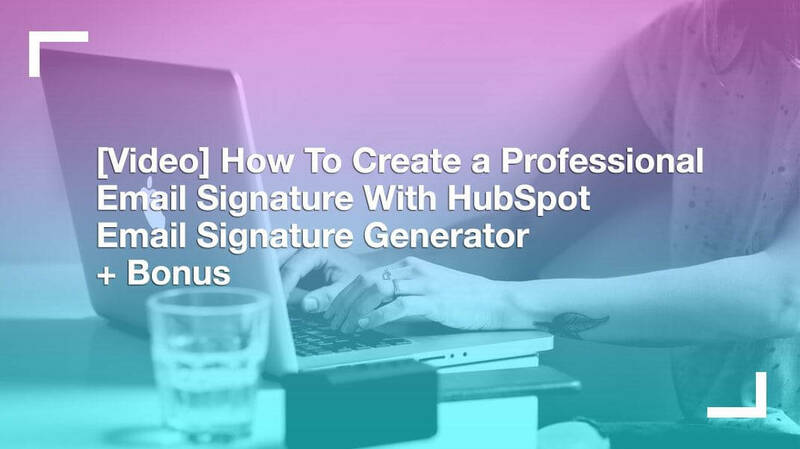 If you haven’t yet, make sure read the blog post about How to create a professional email signature with HubSpot Email signature generator for free.